Bacon Jam has been going around the blog world for some time now, and I couldn't resist making a batch. After looking at several recipes, I noticed the same ingredients were used, and some people added their own flair. I decided to go with these ingredients bacon, onion, garlic, balsamic vinegar, brown sugar, maple syrup and to add some kick, I added red pepper flakes. Simple ingredients, but when you combine them together, you get these amazingly humble rich flavors. 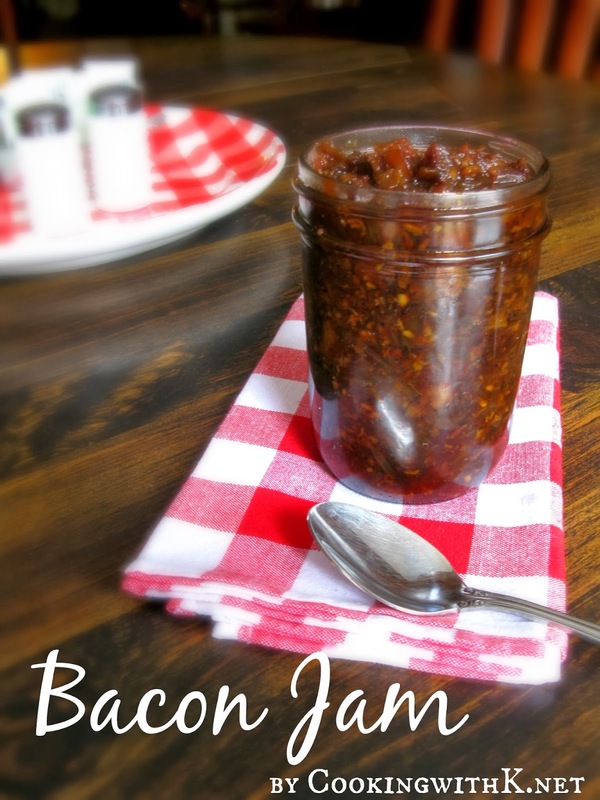 Bacon Jam is really easy to make and will keep in the refrigerator a long time. I am on my second batch, and I can't stop thinking about things to put it on. This Bacon Jam is a great spread on toast or biscuits for breakfast. It goes great on sandwiches or burgers. The possibilities are endless. Enjoy! In a large cast iron skillet, brown bacon. When bacon is done and not to crisp transfer to a paper towel lined dish with a slotted spoon. Remove the bacon from the paper towel and place on another clean paper towel to absorb more of bacon grease. Add onion to reserved grease and saute for about 5 minutes or until onions are limp. Add red pepper flakes and stir until combined. Store in refrigerator until all is used. Will keep in the refrigerator for up to 4 weeks. That definitely sounds irresistible! Definitely bookmarking for later! I can see my husband drooling for this! Coming over from Sweet Tea Social! This sounds delicious! And I love something with endless possibilities. Thank you for linking to the In and Out of the Kitchen Link Party. Hope to see you next week. Yum this look incredibly tasty K. Thank you so much for linking this recipe up at Recipe Sharing Monday. I hope to see you back next Monday. Have a good weekend! I have never heard of bacon jam before! Interesting! Thanks for sharing at Tasty Tuesdays! Pinning to the party board and can't wait to see what posts you share next week! Have a terrific week! 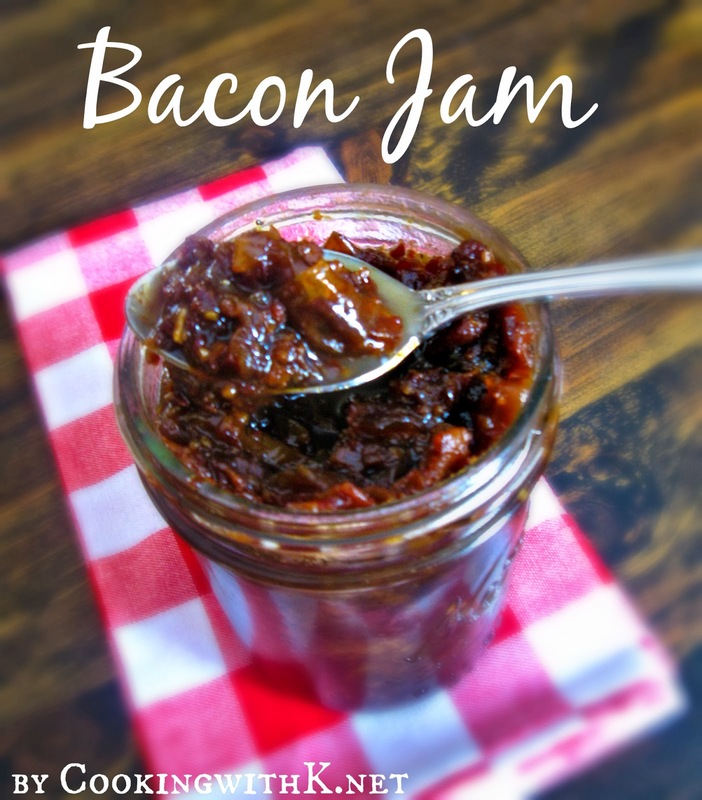 I can almost taste your flavor packed Bacon Jam, I can't wait to make this recipe. Thank you so much for sharing with Full Plate Thursday and have a great week! You had me at bacon...and again at jam. I can't wait to surprise my husband with this! OH.MY.WORD! I've never heard of such a thing and know it has to be TO.DIE.FOR! Thanks so much for sharing with us at Weekend Potluck. WOWZERS! I have to try this, but will have to convert the Lbs to kg. for the Bacon, and not sure if I can buy Maple Syurp in South Africa. but still will have to see what I can do. Sounds so good. Carolyn I hope you get to make some….it will not disappoint! I'm not a coffee drinker so I do not have any on hand. Is there anything that can be substituted for the coffee?